0.7.4 Extended beta period and tweaked the GPS to be less fussy in the store locator. 0.7.3 Extended beta period and added warning (in About) about iTunes messing up their feeds. 0.7.2 Added 7Digital as a new store source plus minor fixes and tweaks to album details scene. 0.7.1 Small fix for some iTunes info handling. 0.7.0 Extended beta period, added automatic searching on a schedule, discography lookups, Amazon and iTunes store searching and many usability and bug fixes. Music Searcher helps you find new music from bands you already love and those you haven�t heard of� yet! Using a list of artists already on your webOS device, Music Searcher looks up iTunes and Amazon stores for new and future release by those artists. When you see something you want just tap, add it to your calendar and your device will remind you again on release day. Preview tracks right there and then (only when provided by the relevant store of course). Search for more information about a release using Last.fm, YouTube, the Amazon MP3 app and a user configurable web site. Share the information with yourself or friends via email, SMS, Twitter and Facebook. Browse and search Discogs.com for releases, artists and labels (with photos and cover art where available) and jump from one band to one of its artists to one of their other bands and so on. when you find something you like the look of go search for albums by whoever it is and check out the samples. Add more artists to keep your eye on either manually, or by importing them from your iTunes library, Last.fm profile or Ampache server. 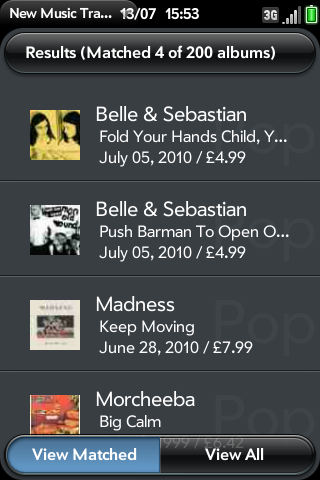 Set Music Searcher to check for new releases automatically for you when you want it to.